Many Windows Phones fans desperate for a mighty new flagship have looked on in horror as Microsoft has instead launched one entry-level handset after another in recent months. After rolling out the Lumia 535 at the end of 2014, the company’s low-end line-up has swelled to include the Lumia 430 Dual SIM, Lumia 435, Lumia 532 and Lumia 540, while slightly older devices like the Lumia 530, Lumia 630 and Lumia 635 also remain on sale around the world. 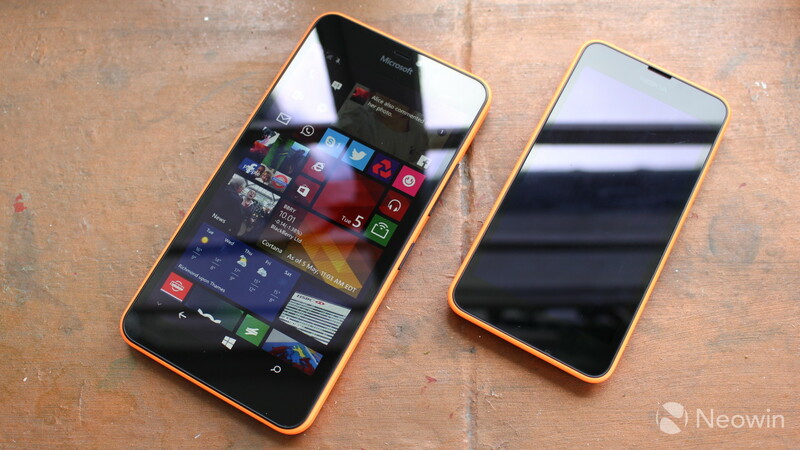 At Mobile World Congress 2015 in March, Microsoft unveiled two more affordable handsets: the Lumia 640 and Lumia 640 XL. But before you write these devices off as just another pair of low-end Windows Phones, let me stop you right there. I wouldn’t blame you at all for simply rolling your eyes at the arrival of two more affordable handsets – there have been similar reactions among the Neowin news team each time a Microsoft press release arrives announcing another cheap Windows Phone. But over the last few weeks, I’ve been testing both the Lumia 640 and its bigger brother, and while neither one is perfect, each of them is worth a closer look. 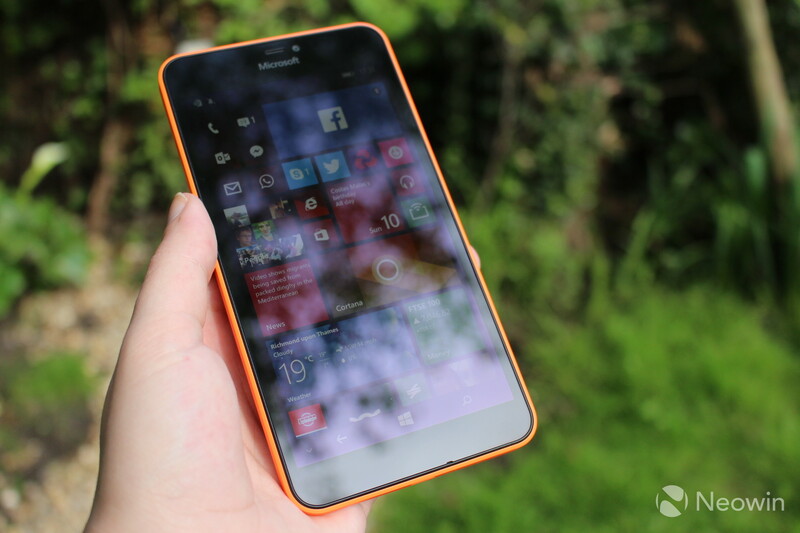 Our review of the smaller handset is coming soon, but first we’re taking a look at the larger Lumia 640 XL. In the year leading up to the acquisition of its devices and services business by Microsoft, Nokia worked hard to bring down the prices of its most affordable Lumia handsets. The problem with many of its cheapest devices was that it was never hard to see where Nokia had cut corners to reduce costs. 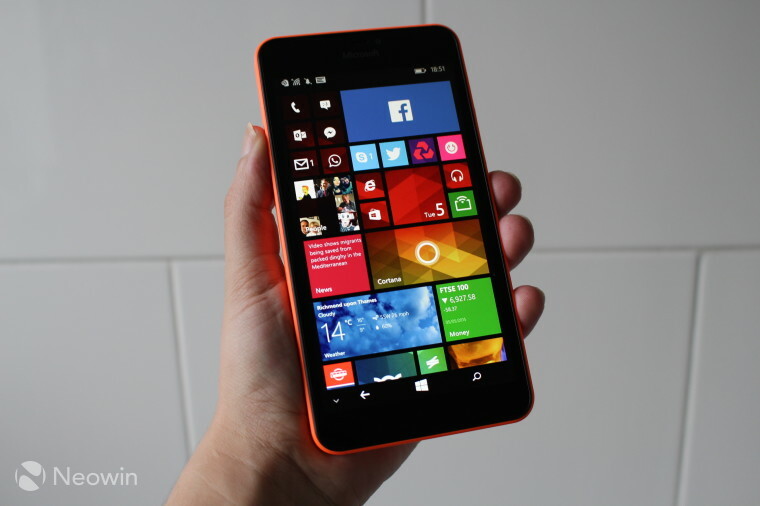 There was a lot to like about devices like the Lumia 630, for example, but it was hard to really love such handsets when they were missing basic features like a front-facing camera, an ambient light sensor, or even an LED flash for the rear cam. 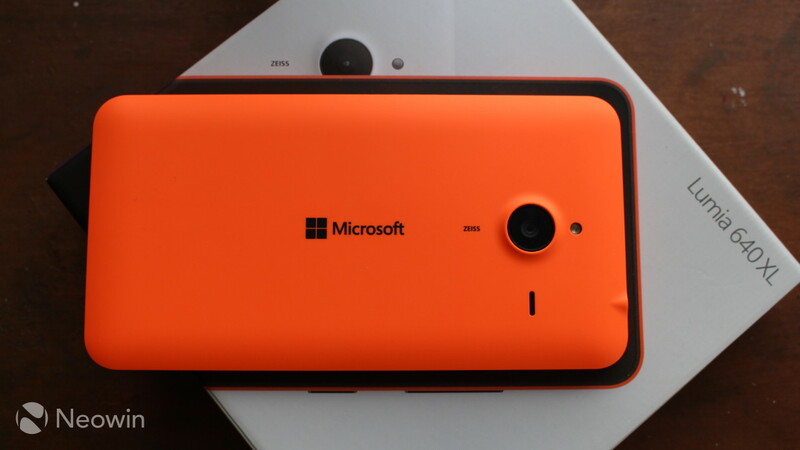 There are no such complaints when it comes to the Lumia 640 XL. Microsoft has ticked all of the boxes that you’d expect on a device in the lower-mid range of the market, along with a few others that might surprise you. We’ll consider some of the specs more closely later in this review, but it’s worth highlighting a few of the more impressive features of the handset. For a start, the days of living without a front-facing camera are long gone – on the 640 XL, you’ll get a 5MP selfie-cam with wide-angle lens and 1080p video capture. Around the back, there’s a 13MP shooter – matching the camera resolution of some flagship phones – with autofocus, 1080p video, LED flash and HDR (high dynamic range) capabilities. On top of this, you’ll get a wide array of integrated sensors; Bluetooth 4.0 LE; NFC (near-field communications) for payments and the like; Miracast wireless screen sharing; a quad-core Snapdragon 400 processor (rather than the Snapdragon 200 in most low-end handsets); and of course, that enormous 5.7-inch display with HD (1280x720px) resolution, protected by Corning Gorilla Glass 3. 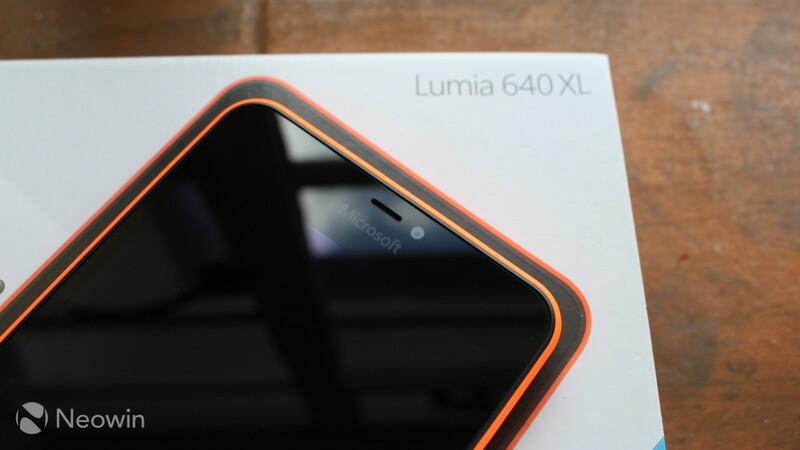 To put it simply, the Lumia 640 XL is packed full of desirable specs that make it extremely competitive – on paper at least – with many similarly priced rivals. Note: In some markets, the device will also be sold with dual-SIM support and 4G LTE connectivity. The version that we’re testing here was provided by Microsoft UK, but it’s actually an Italian-spec model with only single-SIM support and no 4G LTE, but these are the only spec differences compared with other variants of the same device that will be sold in various markets. 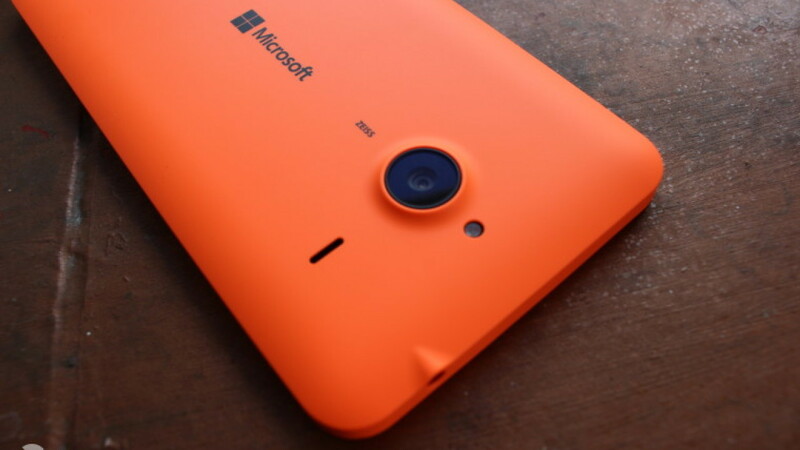 Now, let’s have a quick look around the Lumia 640 XL – and if you’ve ever seen one of Microsoft’s entry-level or mid-range handsets, the look of the device will be instantly familiar. The front is dominated by a sheet of Gorilla Glass 3, with the Microsoft logo proudly displayed across the top, just beneath the speaker grille and front-facing camera. There’s also a tiny cut-out, just off-center, for the microphone at the base of the glass, but fans of hardware buttons will be disappointed that the 640 XL has to make do with on-screen Back, Start and Search buttons instead. 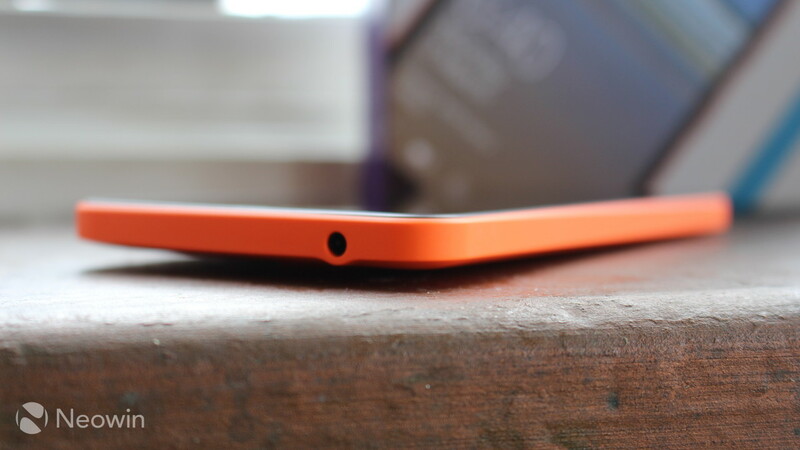 Like other Lumia handsets, the left edge is completely devoid of buttons, while the top of the device is home to a standard 3.5mm headphone jack. At the bottom edge, the microUSB 2.0 port is centered, while the right edge is home to the power button and volume controls – but I know many of you will share in my great disappointment that Microsoft neglected to include a dedicated hardware button for the camera shutter. The Microsoft logo is displayed across the center of the removable rear cover, along with ZEISS branding (for the camera optics), and cut-outs for the camera lens, LED flash and main speaker grille. It’s also worth noting that the camera module extrudes beyond the main bodywork, resulting in a small but noticeable ‘hump’. I expected the hump to result in the device wobbling around when I tapped the screen if it was lying flat on my desk – but I was very pleasantly surprised to find that this didn’t happen unless I really bashed the screen with my finger. 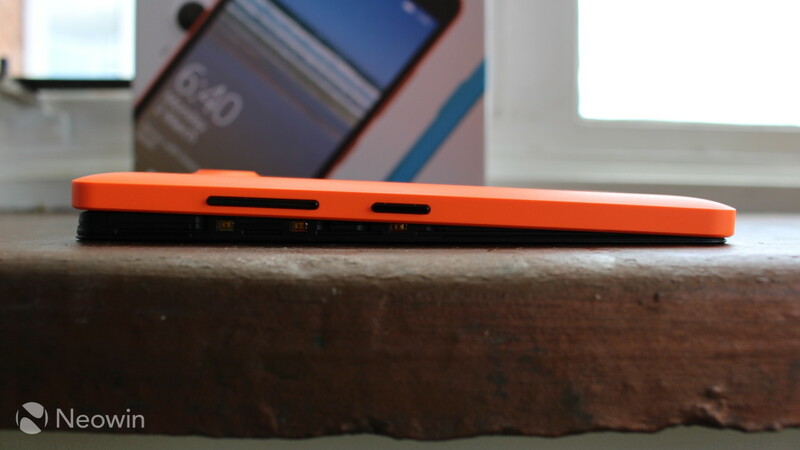 The review unit that Microsoft provided came with a matte orange cover, and personally, I think it looks fantastic. But if the orange doesn't meet with your approval, you can purchase the device with black, white or cyan matte covers, or in a glossy white version (and these covers can also be purchased separately, if you later decide that you want to mix things up a bit). 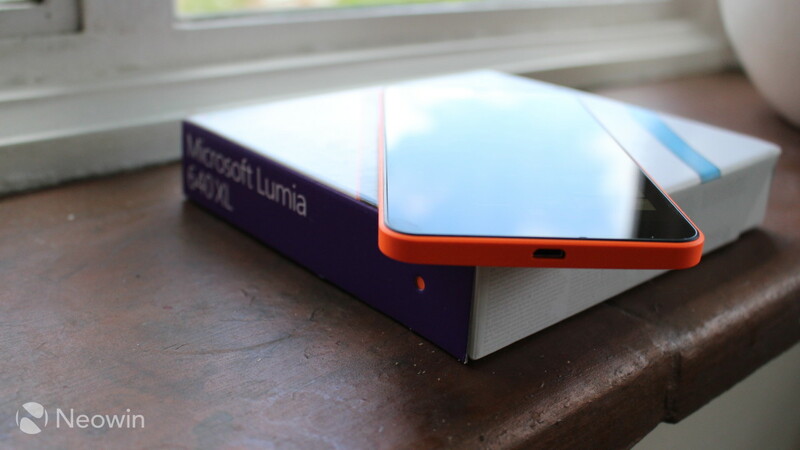 I’ve always found that the matte covers on Lumia devices look and feel wonderful; I’m generally not a fan of the glossy versions which, in my opinion, often look and feel unforgivably cheap. Still, it’s your preference that matters when it comes to buying the device, and it’s great that Microsoft offers various options for those with different tastes. Practically speaking, the matte versions also make the device a bit easier to hold, and less prone to slip out of your hand while you’re stretching your thumb out to tap a button on the screen. The rear cover is fairly easy to remove, once you get the hang of it, and I can’t really fault Microsoft for not making this easier, since it’s unlikely that most users will be doing this very often. Under the cover, you’ll find the large (and replaceable!) 3000mAh battery, along with slots for the microSD card (up to 128GB supported), and microSIM card (note that the second microSIM slot is plugged up on this model). The handset's build is excellent, especially at this price point - it feels absolutely rock-solid, with not a hint of flex or creakiness in its construction. This is one handset that seems unlikely to suffer through its own 'Bendgate' scandal. 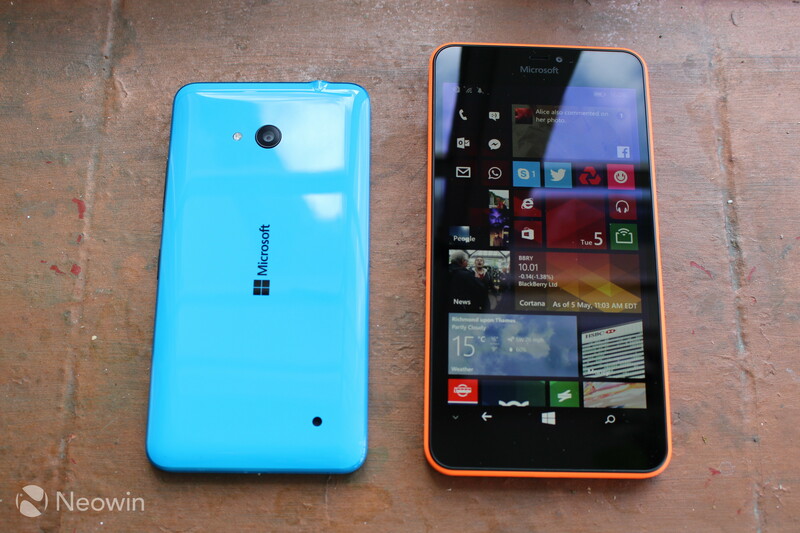 But honestly, I can't shake the feeling that the Lumia 640 XL's design is just a bit too familiar. It looks like many of Nokia's older Windows Phone devices, and it looks like other low-cost handsets that Microsoft has launched, albeit scaled up to a larger size. Don't get me wrong, I think it's a good-looking device, and there's certainly nothing offensive about its styling. It's just that this general design has been seen so many times before on Lumia handsets and, well, I'm personally getting a bit bored of it. Yes, smartphones are now basically all big rectangles, but it's surely not beyond the capabilities of an experienced design team to mix things up a bit in the looks department. Perhaps we'll see a bit more design flair when Microsoft launches its new flagships later this year. 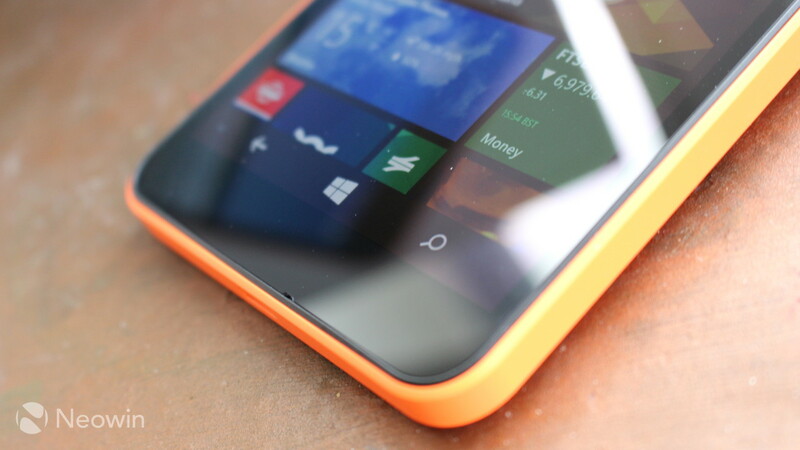 Of course, the headline feature of the Lumia 640 XL is its display, which lives up to the promise of its name. At 5.7-inches, it’s absolutely immense – although it’s actually slightly smaller than the 6-inch screen of the Lumia 1320 that this device effectively replaces. The panel offers HD (1280x720px) resolution, and while some of you may lament the fact that – given its size – it’s not Full HD (1920x1080px), that’s not a very realistic expectation in this price range. But even at 720p, the display still offers 259ppi pixel density, and you have to look pretty closely at it before you see individual pixels or anti-aliasing effects around text, although the same resolution on the smaller 5-inch Lumia 640 does provide noticeably sharper details when compared side-by-side. The XL’s screen also offers excellent brightness, and it’s all the more remarkable for managing to maintain decent color fidelity even at its brightest setting. The ClearBlack technology that Microsoft acquired from Nokia is put to great use here, with excellent contrasts and deep blacks (although not quite as deep as you'd get from an AMOLED panel), while saturation has been well calibrated to ensure that colors generally appear vivid, but not exaggerated. The 640 XL includes an ambient light sensor, so you can choose to let the device set screen brightness automatically – a feature that was infuriatingly absent in some earlier low-cost Lumias. This setting worked extremely well in my experience – for example, allowing me to read a web page with a white background in a dimly lit room without the screen brightness suddenly burning my retinas, and without having to manually adjust the brightness to compensate. The display also deserves praise for its superb viewing angles, with very little color variation even at extreme angles, which made watching a quick YouTube video or flicking through photos with friends a very enjoyable experience, and the sheer size of the display certainly added to this. Compare this with a truly low-end device like Acer's new Liquid M220 - which has some of the worst viewing angles I've ever seen on a smartphone - and I'm sure you'll appreciate why this matters. It's also worth noting that the Lumia 640 XL shares none of the excruciating usability flaws that afflicted the earlier Lumia 535 – the first Microsoft-branded smartphone – which suffered from some appalling response issues when interacting with the display. As with any device, the 640 XL occasionally required a second tap to open an app or click on a link, but the input response of its display was generally excellent. 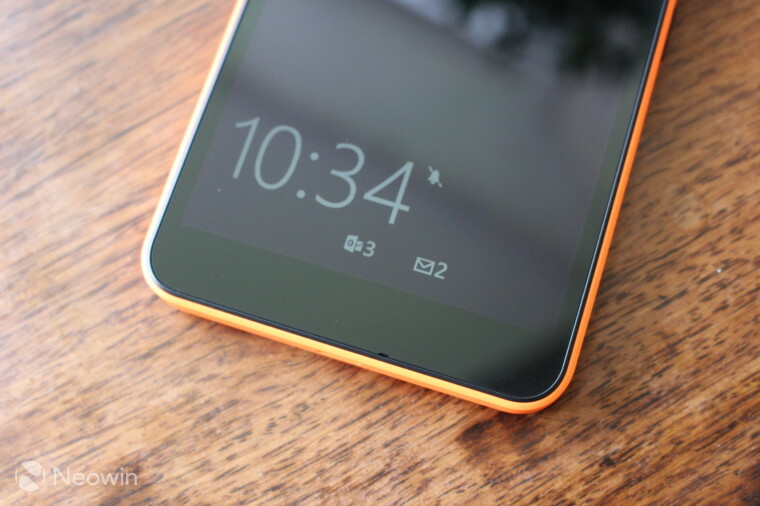 The Lumia 640 XL also offers one feature that first appeared on Nokia’s flagship Lumia handsets – in fact, it’s a feature that didn’t even make it into the last top-of-the-range Windows Phones ever released (the Lumia 930 and Lumia Icon): Glance Screen. This ultra-low-power feature shows time and basic notifications on the display even when the screen is effectively turned off, and you can customize the settings to minimize power consumption even further. The display also supports double-tap-to-wake, so if the phone is lying on your desk or your bedside table, you can simply double-tap the screen to power it up, instead of fumbling around to find the power button. Now, let’s talk for a moment about size and weight. Whichever way you slice it, the Lumia 640 XL is absolutely ma-HOO-sive – but Microsoft has done a pretty good job of disguising its considerable weight. At 171 grams, it’s one of the heaviest handsets out there, but it doesn’t feel like it weighs anything like that. Part of this is down to the distribution of that weight over a wider area; the brilliant Lumia 920, for example, weighs just 14g more but feels dramatically heavier, since its weight is densely packed into a smaller device. 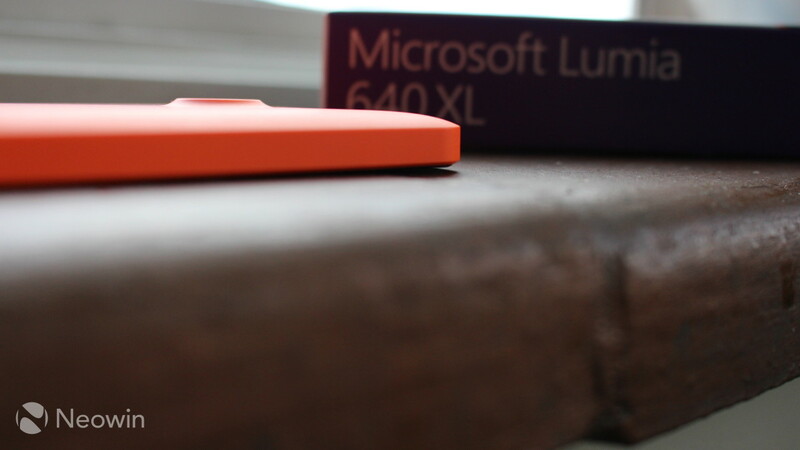 While weight isn’t a big issue with the 640 XL, its size is something worth considering. I don’t have the smallest hands in the world, but I still found it a real strain to use the device comfortably with one hand, especially when trying to reach the upper half of the screen. Using the device with two hands was an absolute breeze, particularly with the large keyboard – but that keyboard was much more challenging to use one-handed. At times, it felt like I was in danger of dropping the phone while trying to stretch my thumb over to reach the left-most buttons, or buttons and links further up the screen. Now, that’s not going to be an issue for everyone – especially those with larger hands – but if you’re thinking of buying a Lumia 640 XL, it’s certainly one worth considering. 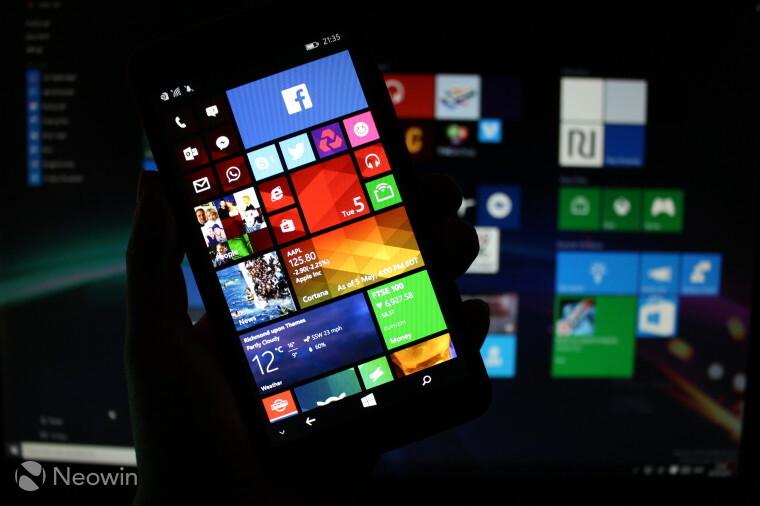 The Lumia 640 and 640 XL were the first two handsets to launch with Windows Phone 8.1 Update 2 pre-installed. There’s not a great deal to get excited about in this latest version, but there are a couple of welcome features. There’s a redesigned Settings hub, more logically organized into various sections that you can ‘jump’ to by tapping any of the headings, as well as a new search function. 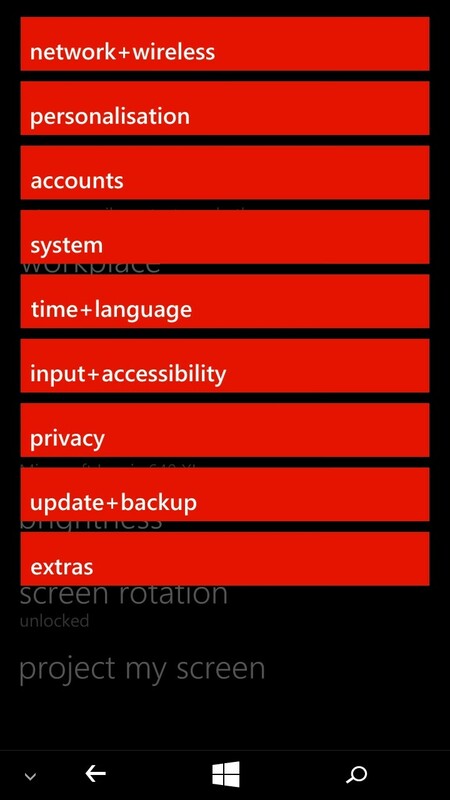 If you’re familiar with Windows Phone, you’ll know that this is a great improvement over the utterly horrible long list of settings in no particular order that the OS has had to suffer with for years. 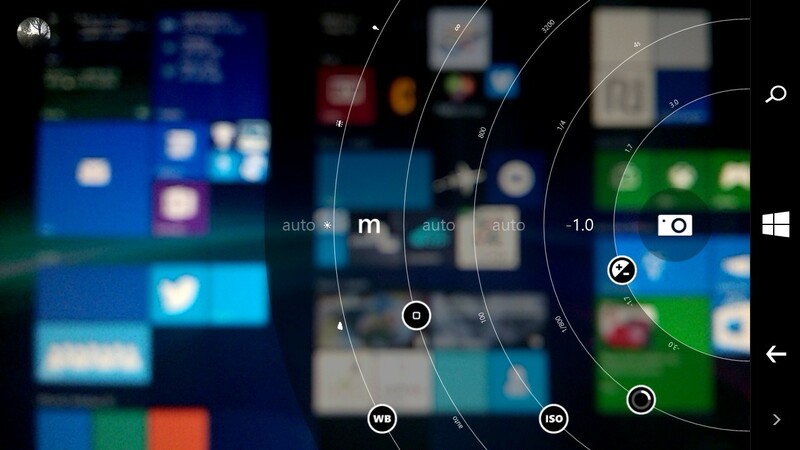 For the first time, you can also pin individual settings to the Start screen – and if you’re wondering why it’s taken Microsoft this long to make that happen, you’re not the only one. Another welcome addition is that of native MKV video playback support, which lets you watch these files on the handset via the pre-installed Xbox Video app without needing to download any additional software or codecs. Update 2 also introduces new remote ‘kill switch’ functionality, in compliance with new US legislation intended to provide a disincentive for mobile device theft. 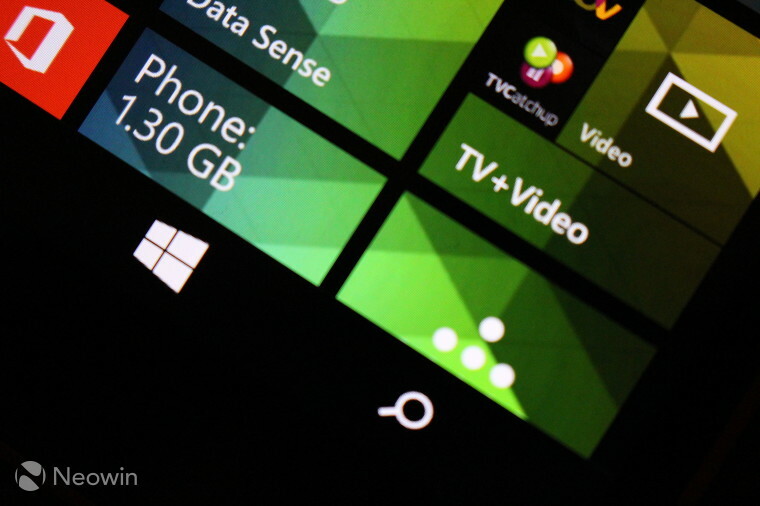 But besides these additions, the OS will otherwise be very familiar to anyone who has used Windows Phone 8.1 before. If you weren’t a fan before, Update 2 won’t do anything to win you over, but if you have a soft spot – or a hard spot, perhaps, depending on the level of your passion – for the OS, you’ll probably appreciate these latest improvements. In certain markets, of course, that means you’ll get features like Cortana, Microsoft’s brilliant digital ‘personal assistant’, but even where that feature isn’t available, the OS still has a great deal to offer. With Windows 10 for phones coming in the next few months, it seems a little pointless to spend too much time discussing the OS in great detail, especially given that we’ve covered it extensively in earlier reviews. But it’s worth mentioning that if you buy the Lumia 640 XL, you’ll still have to be ready to deal with the app situation on Windows Phone – and you should think very carefully before jumping in if you’re a first-timer to the platform. Yes, many of the top apps are here – including the likes of Facebook, Twitter, Pinterest, Spotify, eBay, WhatsApp, Vine, Viber, LINE, Evernote, Dropbox and many, many more. But a presence on the platform is no guarantee of high quality – the BBC iPlayer app in the UK, for example, is little more than a weak web wrapper, which lacks many, if not most, of the rich multimedia features available in the same app on other platforms. The Instagram app hasn’t been updated in over a year and, yep, also lacks features available on rival operating systems. 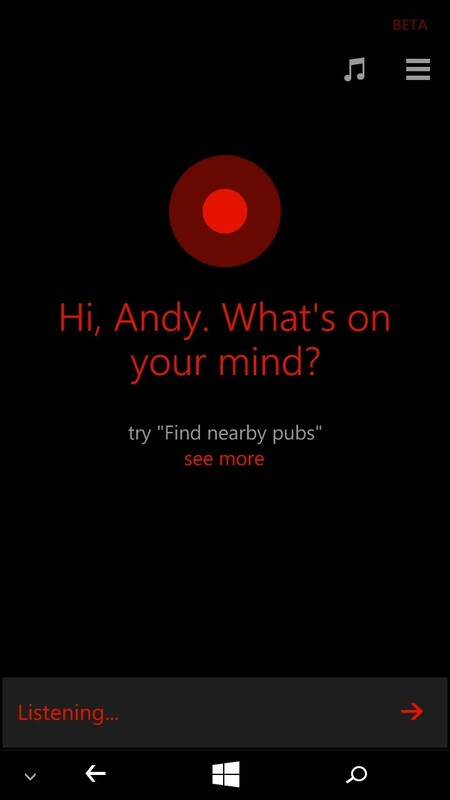 This is a common story when it comes to Windows Phone apps. 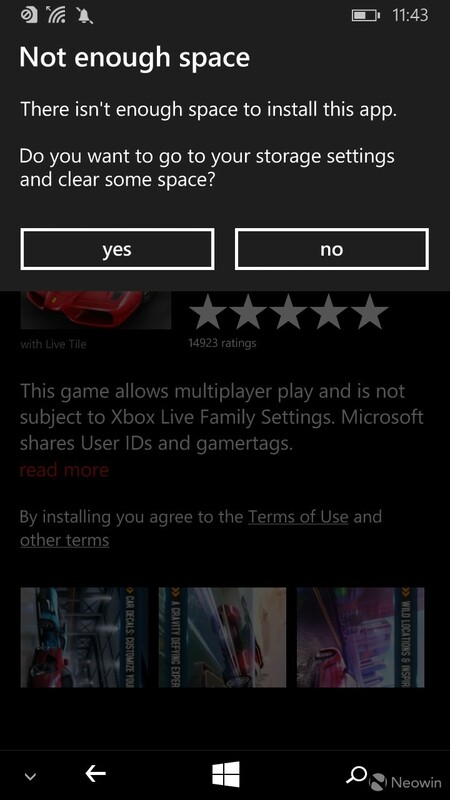 When it comes to some of the less heavily-downloaded apps – those that aren't really 'top tier', but which smaller groups of people consider important or useful; like your bank, your local cinema, your preferred airline, etc – there’s a good chance they won’t be in the Windows Phone Store at all. With global market share for the platform still at less than 5%, there’s little incentive for brands and developers to offer and support apps on Windows Phone for now. 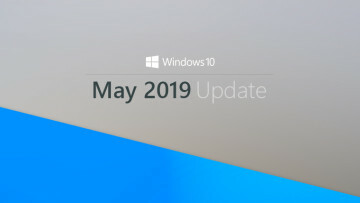 This situation should improve with major new plans to make it easier for developers to bring their iOS and Android apps to Windows 10 for phones, but it will take time for the effects of this to kick in, so be sure to adjust your expectations accordingly. 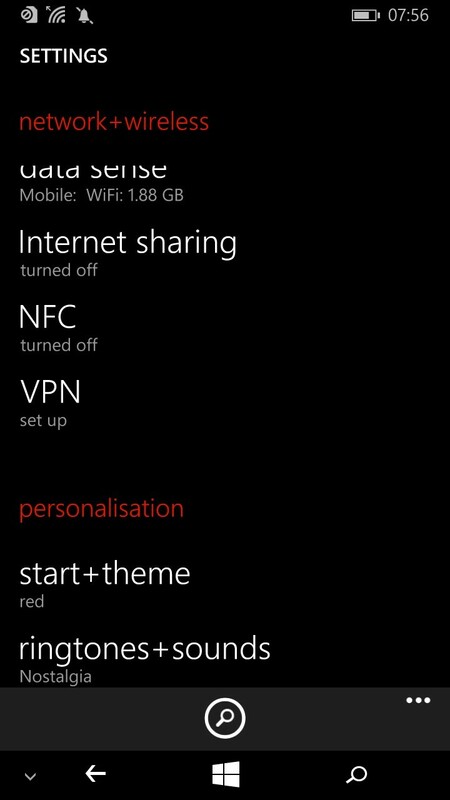 Still, it’s worth highlighting some of the excellent software that Microsoft pre-installs on the Lumia 640 XL, ready to use out of the box. 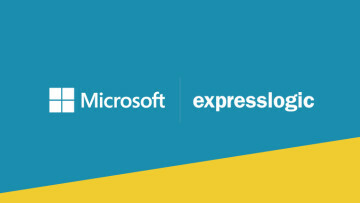 Its suite of MSN apps – including News, Sport, Weather, Money, Food & Drink and others – is brilliant, and while they’re not unique to Windows Phone any longer (MS has also ported them to other operating systems), they remain top-notch examples of well-designed and highly functional apps on the platform. 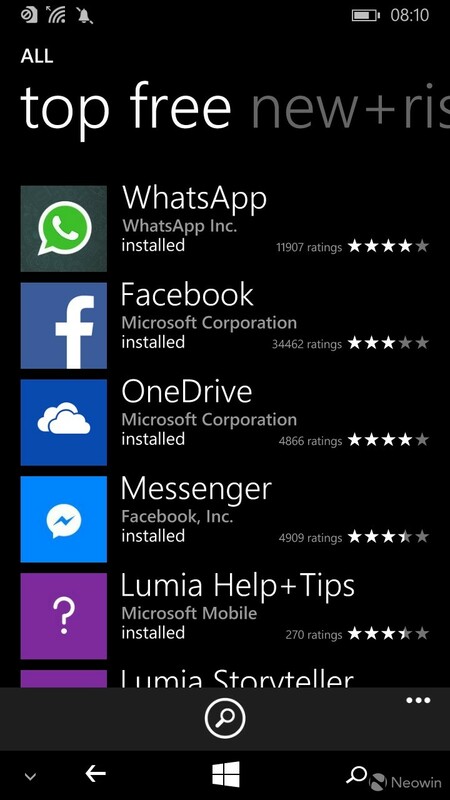 Microsoft also inherited many apps from Nokia, some of which are pre-installed on the device, while others can be found in the Store under the ‘Lumia collection’. Some of these are fun tools, like the Lumia Selfie app, which lets you quickly edit and add filters to make your selfies look that little bit more fabulous. There are also great camera tools like Lumia Refocus, which allows you to take a pic and then shift the focus of the image later. There's one last bit of software worth mentioning, although it's not actually intended for your phone at all. The Lumia 640 and 640 XL are the first two handsets to come with a free one-year Office 365 Personal subscription for your PC. 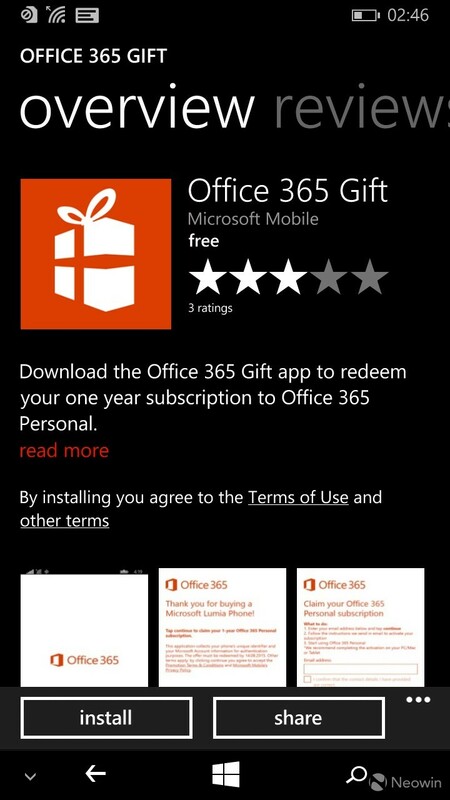 Worth around $70 in the US and £60 in the UK, this adds a huge amount of value to the handset, and can be easily redeemed via the ‘Office 365 Gift’ app, that can be found by navigating to the Lumia collection in the Windows Phone Store on the device itself. Unlike many of the low-cost Windows Phones that have popped up in recent months – and not just from Microsoft – the Lumia 640 XL doesn’t feature the entry-level Snapdragon 200 processor, but the next one up in Qualcomm’s line-up: a quad-core 1.2GHz Snapdragon 400. This isn't the latest processor in its class - it's been superseded by the newly-introduced Snapdragon 410, which will feature in LG's new Lancet Windows Phone. 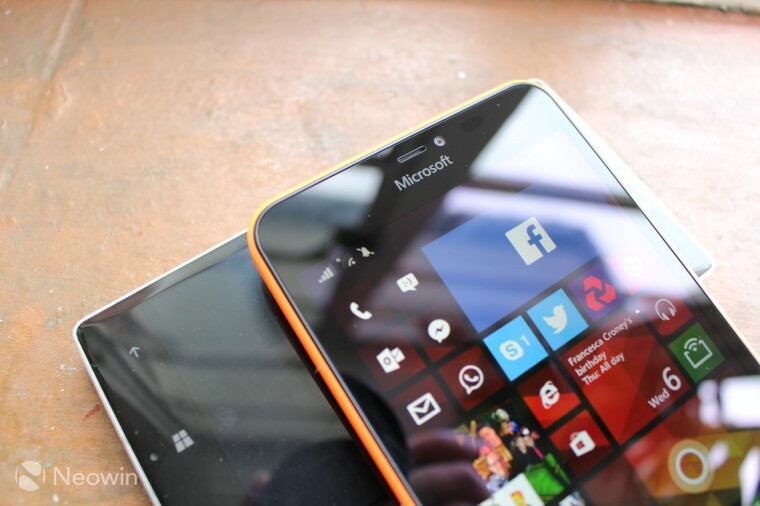 But I was pretty impressed with the performance of the 400 when I reviewed the Lumia 630 last year – and paired with a full 1GB of RAM on the Lumia 640 XL, it was similarly impressive. I've never been a fan of performance benchmark tools - especially given the fact that comparisons with other devices can be easily rendered meaningless by firms that manipulate benchmarks to make their handsets appear better. As in other reviews that I've written for Neowin, my report on the handset's performance is therefore based upon my own real-world experience, rather than on benchmarking analysis. 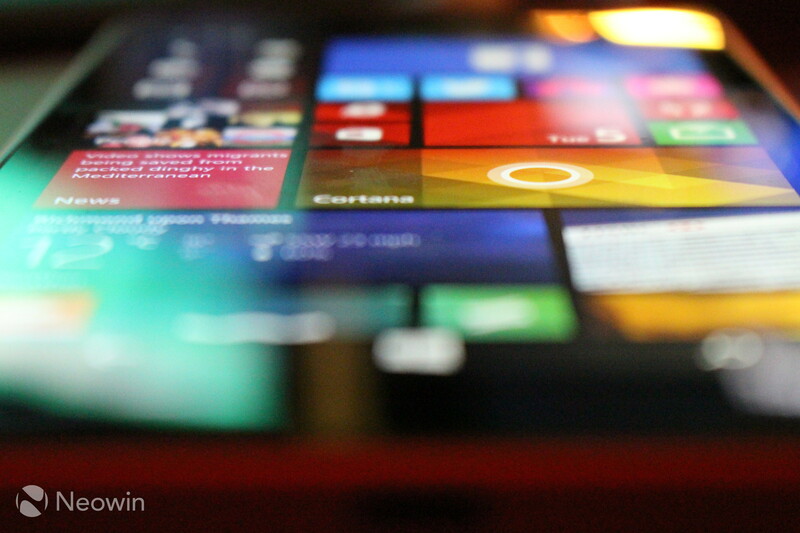 Microsoft has worked extensively to optimize Windows Phone to work well even with the most modest specs, so it was no great surprise that the OS ran extremely well on the Lumia 640 XL, without a hint of lag while navigating throughout the interface. That said, while you won't be waiting around for menus to load, you might get the occasional moment when the transition animations in the OS aren't quite as smooth as you might expect. If you have a few apps open, for example, tap the Start button, and you might just spot the tiniest bit of stutter as the tiles animate in - but this is the kind of thing that would annoy those who obsess over such details (i.e. irritating people like me), and it's likely that the 'average' user would never even notice. If you want to push any mobile hardware to its limit in regular use, games are probably the best indication of how much the specs can handle. 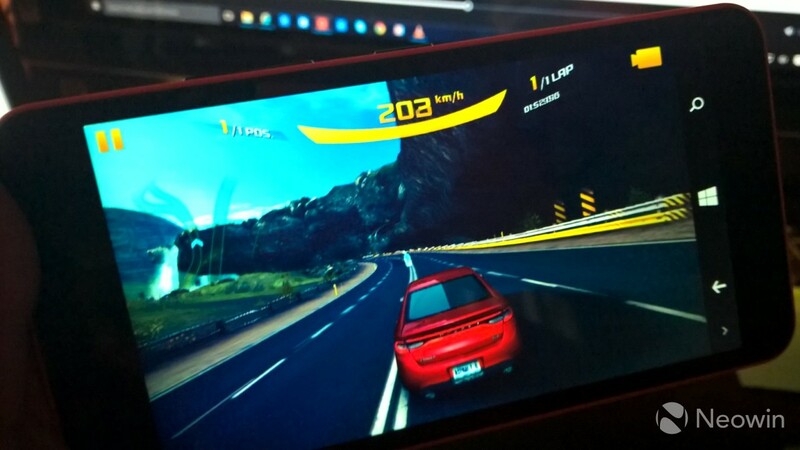 I’m not a big mobile gamer personally - I generally dabble in casual gaming when I have a few minutes to spare - but I took Asphalt 8 out for a spin and found that it ran without any problems at all on the device (and it looked pretty good on the XL’s massive screen), although it did take a while to load. However, if you’re a big mobile gaming fan, you should make sure that you invest in an additional microSD card to expand available storage on the device. The Lumia 640 XL comes with just 8GB of onboard storage – that’s enough to handle many of the apps that users will want to install, but add a couple of graphics-heavy games like Asphalt 8 or the new Halo: Spartan Strike and you’ll run out of space pretty quickly. If you want to store music on the device as well, that 8GB just won’t be enough. Since I'm not an obsessive mobile gamer, and I stream most of my music rather than keeping it on the device, storage wasn't a huge problem for me during the few weeks that I was testing it, although inserting a microSD card certainly took the pressure off having to decide which apps to uninstall before I could add new ones. But even those who don't care for games and who don't store music on their device will likely find the phone up filling up with photos and other data after a few months, so an extra storage card will be a wise investment. 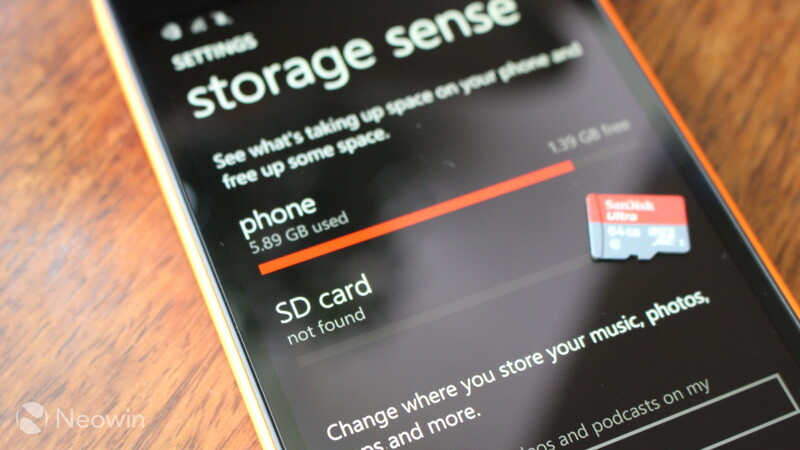 The limited storage on the 640 XL is honestly disappointing. The device costs £219 GBP in the UK (around $330 - although US pricing has not yet been announced) - around the same amount as Samsung's Galaxy A3, which features 16GB of storage, and a newer Snapdragon 410 processor (but it also has a considerably smaller display). Understandably, Microsoft had to make some trade-offs on the spec sheet, but 8GB still feels a bit stingy for the price. But since microSD cards can be purchased inexpensively, one could argue that this is a better alternative to paying the large premiums that manufacturers often demand for additional integrated storage. 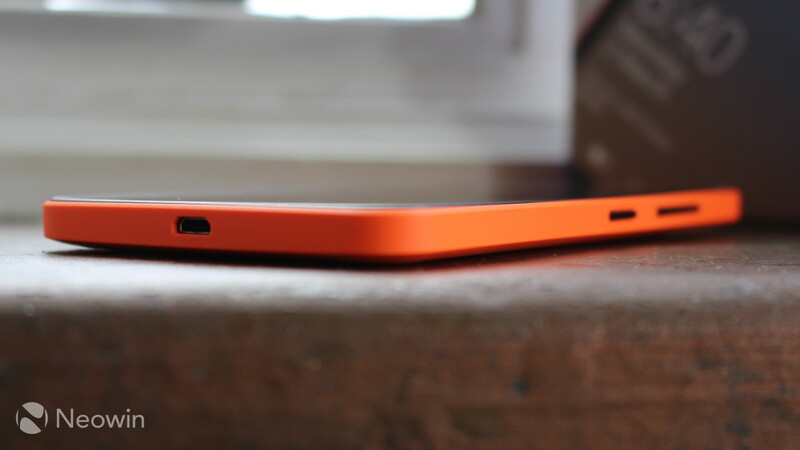 You should also note that the Lumia 640 XL doesn't come with a headset, so you'll have to bring your own headphones or hands-free unit to the party, which you can either connect via the standard 3.5mm headphone jack, or via Bluetooth 4.0. If you spend more of your time talking on the phone than using it to play games and the like, you’ll be pleased to hear that Microsoft did a great job in ensuring that the device offers superb call quality. The ear speaker offered crisp and clear in-call audio, and only in extremely windy outdoor conditions, or when in a very loud and bustling indoor environment, did anyone struggle to hear me speaking to them. 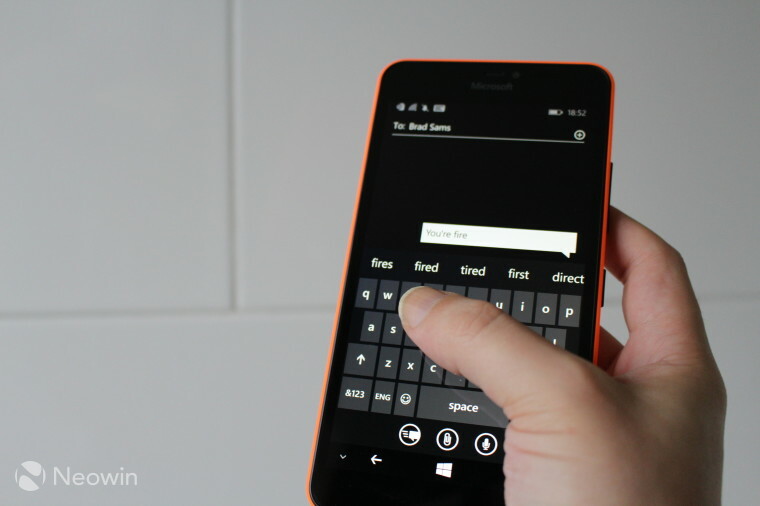 The Lumia 640 XL also did a pretty decent job of picking up and holding onto 3G signal. As long as you don’t expect the Lumia 640 XL to beat a flagship like the 930/Icon or 1520, you shouldn’t be at all disappointed with how it performs in regular usage. The XL succeeded in handling every task I threw at it – from the basics, like Facebook and phone calls, to quickly switching between a bunch of open apps like Word, OneNote, Skype, Netflix, Amazon and Trivia Crack. The Lumia 640 XL has a large 3000mAh battery, which is certainly to be expected, given the size of the display that it has to power, along with all the other tech crammed into the handset’s body. But the capacity of that battery is still pretty impressive, especially given the price of the handset – to put it into context, the recently launched LG G4 Android flagship also has a 3000mAh battery, but it has to run a high-end hexa-core Snapdragon 808 processor and Quad HD (2560x1440px) display. Like most users, I often dip into other apps, such as those for shopping and banking, along with the odd bit of video streaming via apps like YouTube and TVCatchup. Broadly speaking, I think it’s fair to say that all of this isn’t too far removed from how a large proportion of handset owners use their devices. 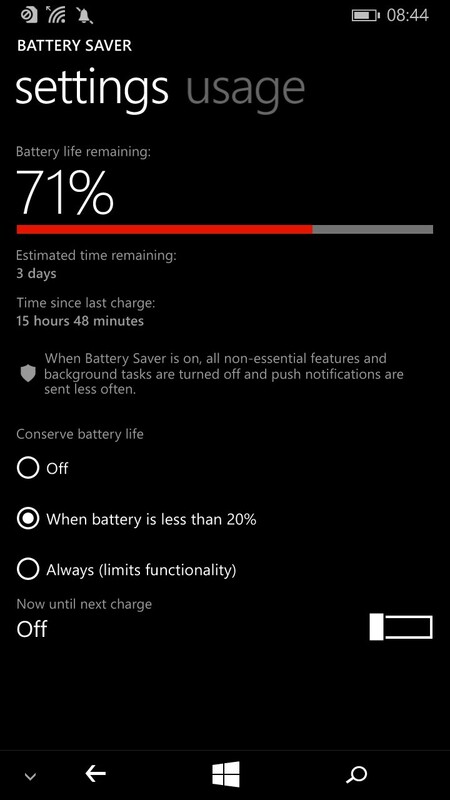 With this type of usage, my Lumia 930 is often running on nothing but its own fumes by around 10pm, if I haven’t managed to find somewhere to give it a quick charge before the end of the day. 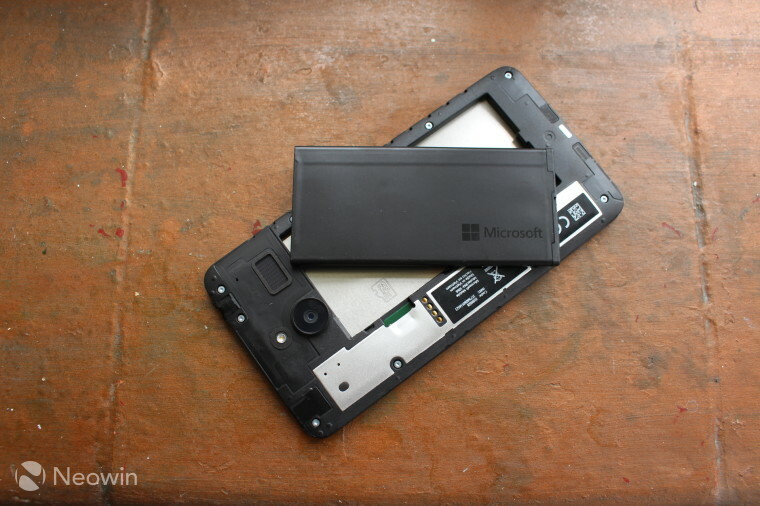 But with the same sort of usage, not once did the Lumia 640 XL run its battery flat by day’s end. Indeed, my own batteries needed to be recharged with a good night’s sleep long before the 640 XL needed more power. At best, the device managed to run for almost two and a half days before it finally gave out – although I hadn’t played any games or watched any videos on the device during that period, which certainly would have made a difference. At worst, I returned home at 2am after a very long day to find that the device had just kicked into Battery Saver mode, with 19% remaining. Your experience will vary – perhaps significantly – depending on exactly how you use the handset. If you play games or watch videos all day long, the battery will die much more quickly, and as with any device, you’ll also find that taking lots of photos will slurp up plenty of the XL’s remaining juice. But there are various ways to extend the handset’s battery life, such as reducing screen brightness whenever possible, switching off Glance Screen (although this uses only a relatively small amount of power) and adjusting various settings, such as switching off push email. 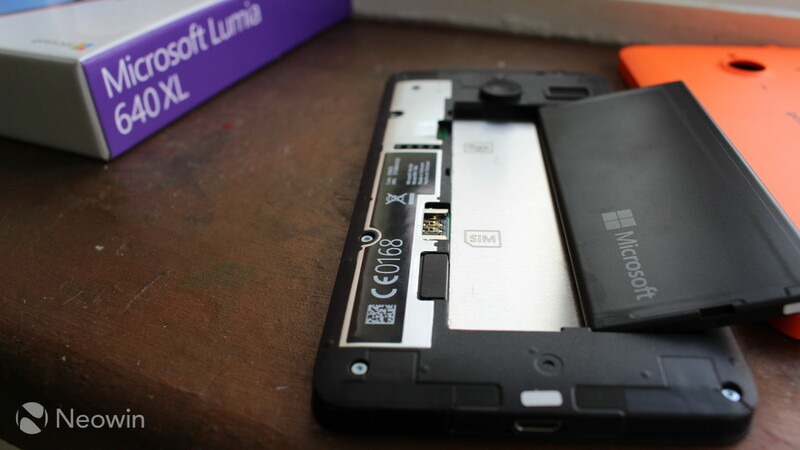 And don’t forget that the Lumia 640 XL’s battery is removable – so if you’re the kind of user that likes to enjoy every capability of your handset without worrying about how much power you’ve got left, you can always pick up a spare and switch it out as needed. Without having tested the 640 XL LTE, I obviously can’t comment on its real-world battery performance. But as far as this specific model goes, I was very pleasantly surprised by just how well the Lumia 640 XL managed its power, and I would imagine that the overwhelming majority of users will have no problem at all getting through the day without ever needing to worry about how much battery life they’ve got left. There are plenty of flagship-class devices that have cameras with 13-megapixels, and these often do the job pretty nicely. So it's certainly impressive to see that Microsoft has squeezed a 13-megapixel sensor into the Lumia 640 XL - a device that costs less than half the price of many range-toppers. Of course, megapixels aren't everything - which is why Microsoft has also added ZEISS camera optics to the 640 XL. That's an impressive addition to a lower-mid-range device, considering the fact that ZEISS optics have traditionally been reserved for the PureView family of devices. Now, it's worth pointing out that it isn't a PureView device, and its camera lacks much of the sophisticated architecture that the more complex PureView cameras have on higher-end Lumia handsets. As a result, certain features - such as optical image stabilization - aren't available on the Lumia 640 XL, but it does have auto-focus, a backside-illuminated sensor, dynamic flash and rich capture capabilities. 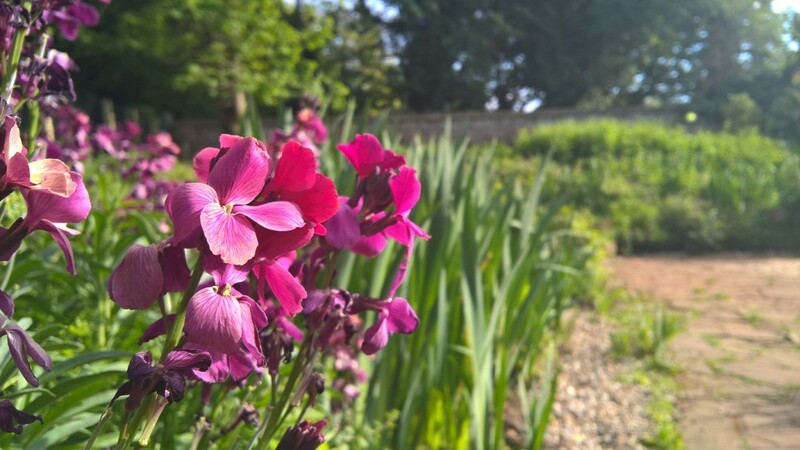 The Lumia 640 XL's camera is pretty good, and for a camera in this price range, it's really rather impressive in many ways - but it's not perfect. For example, take the image above. It's a pretty scene, and there are some decent contrasts in there. But the colors appear relatively flat, compared with how the scene actually appeared when I took the photo. 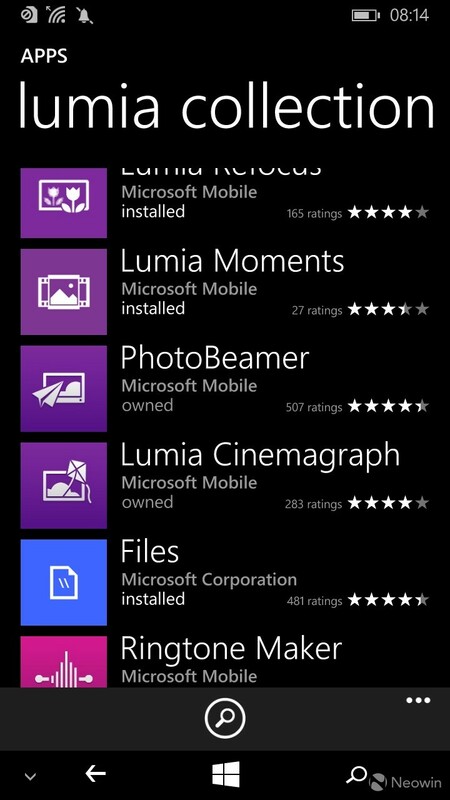 Note that, except where otherwise stated, all of the photos taken with the Lumia 640 XL shown here used full auto/default settings. The same can be said for the colors in the image above - again, the range and richness of color in the actual scene hasn't quite been matched here. But while the Lumia 640 XL's camera doesn't capture absolutely perfect shots every single time, you mustn't get the wrong idea - this camera is capable of taking some lovely photos, like the one above. The sun was blasting all over the greenery in this image, and the XL's camera pounced on that eagerly, capturing a much more diverse range of greens than in the previous image, with excellent contrasts and superb color reproduction true to the scene. The level of detail in the scene is also impressive, and it's also where that 13-megapixel sensor comes in handy. The amount of detail that the XL's camera captures makes it easy to use a tool like Microsoft's pre-installed Lumia Creative Studio to crop and edit the pic later. 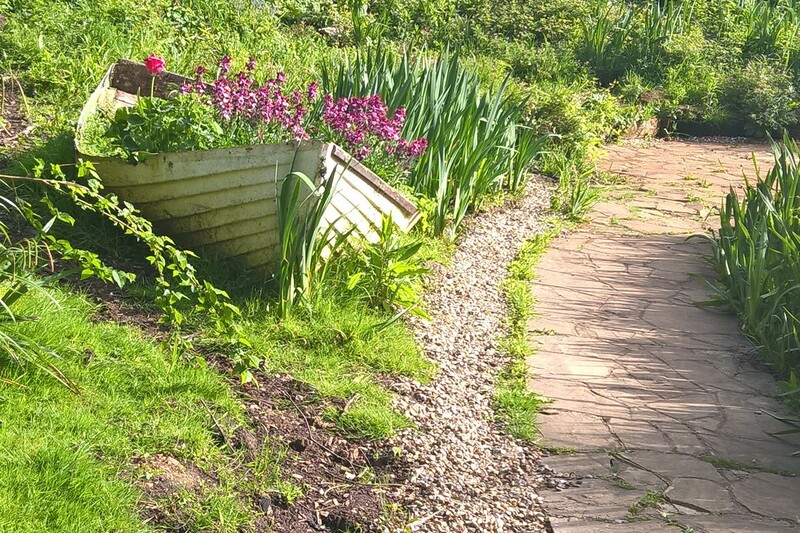 So, for example, I later looked back at the previous photo of the boat in the garden, and decided that it might have turned out better without the big wooden posts on the left and the wall in the background. 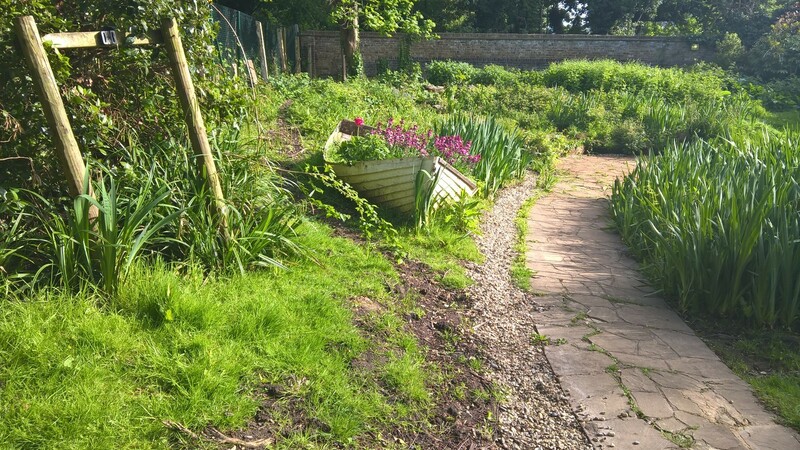 With Lumia Creative Studio, it took me about 45 seconds to switch the aspect ratio of the pic (from 16:9 to 4:3), and then zoom in to crop the photo around the area that I wanted to focus on. The result is the image above, unedited apart from the crop - and it allowed me to keep the original photo too, in case I wanted to make other edits or changes later. With this simple edit, I was able to transform a photo that had been blighted by some unsightly details into a more attractive scene. Of course, you'll lose more detail the more you zoom in, but you can crop and zoom quite a bit before the images start to become too fuzzy to be usable. 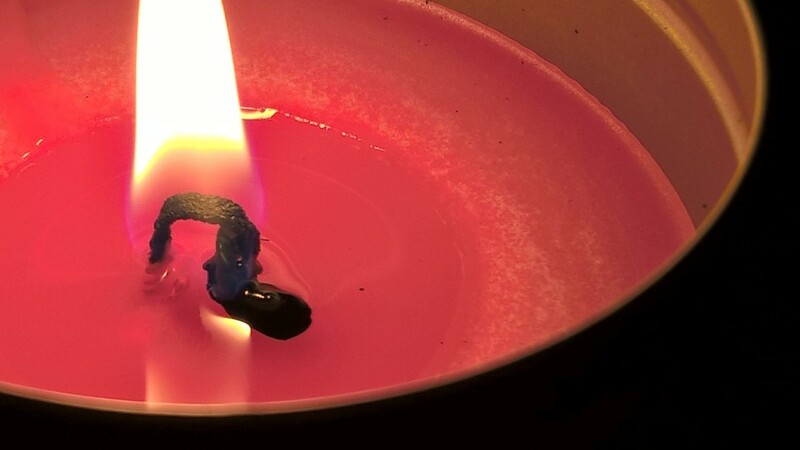 Here's another trick that the Lumia 640 XL's camera can do. Consider the image above. 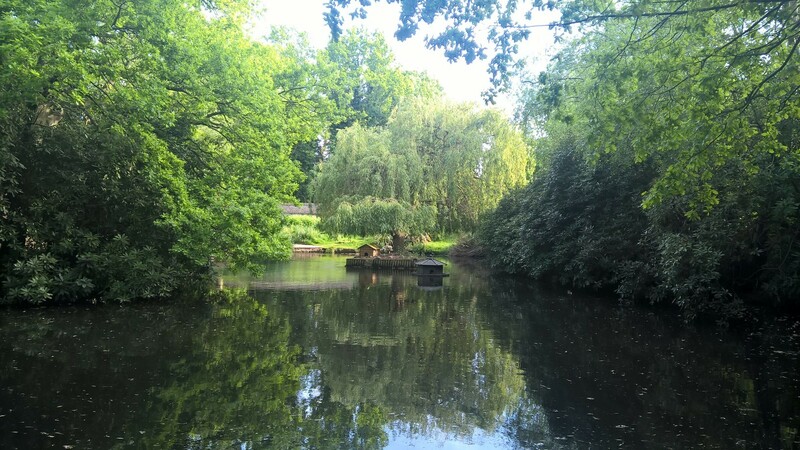 It's actually a pretty good effort by the camera to capture so many shades of green, while the lens is being pointed from a shaded location towards one bathed in late-evening sunlight. But you can certainly see that towards the tops of the trees, in the background especially, the camera eventually struggled with some of the detail in color and contrast. 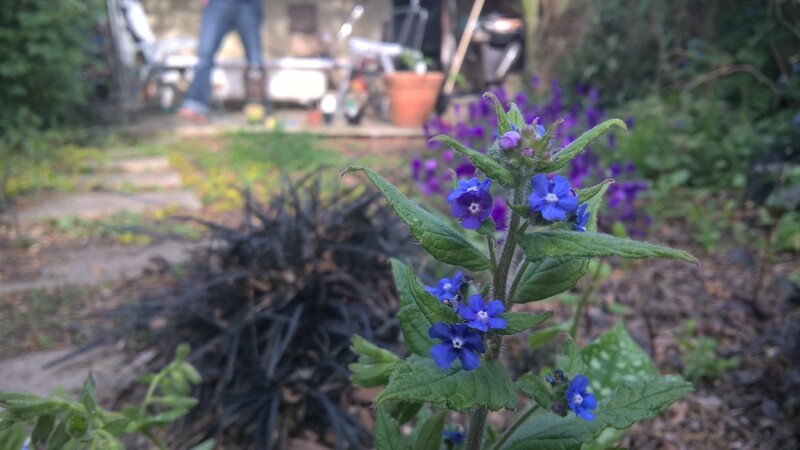 But tap the magic 'Rich Capture' button in the Lumia Camera app, and take the same photo again, and you'll see much deeper and more vibrant colors, and a new level of detail and contrast exposed in some areas that appeared a little more washed out with the 'auto' settings on. In fact, this does occasionally have a tendency to over-exaggerate color and contrast on occasion, although it's hard to deny the appeal of photos that burst with color like those taken with the Rich Capture mode engaged. But for those users who prefer a bit more control over their photo-taking, there are also more granular camera settings, allowing you to adjust white balance, ISO levels, and the like, while you're lining up the viewfinder to take the picture. You can also adjust zoom and depth of field, and playing with the latter can produce some lovely-looking photos with the Lumia 640 XL. In both of these examples, the camera has been set to focus on an object in the foreground, while softly blurring the background. But if you're not too keen on playing around with the settings, the camera does have auto-focus capabilities built in, offering slightly less stylish, but still aesthetically pleasing, photos. Here's another good example of that depth of field, and of the level of detail that the 640 XL's camera can pick up. 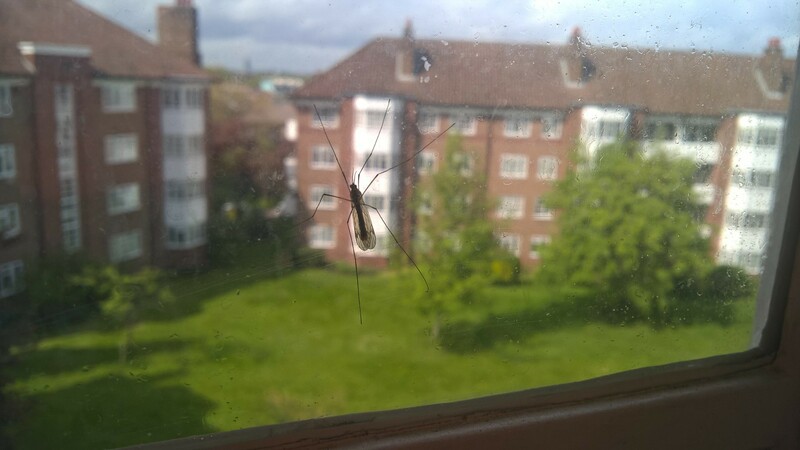 This cheeky winged creature decided to stop off my window to chill out for a bit, so I set the camera up to focus on the beast itself, with the other apartment buildings out of focus behind it. By zooming in and cropping the photo, I was able to focus the image on details of the creature that weren't so easily visible in the original picture. Also, it made it painfully clear that I haven't cleaned my windows in quite a long time. But what about low-light performance? Surely you can't expect much of the camera on an affordable smartphone when it comes to low-light? Let's not pretend that the above photo is perfect - it's clearly not. 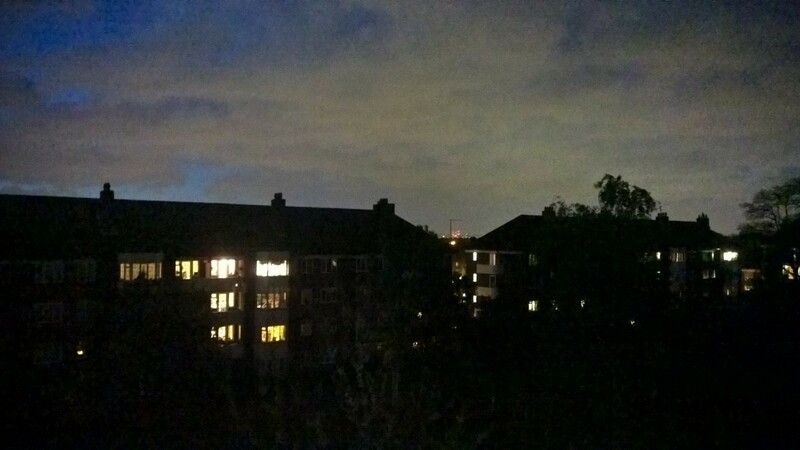 But this was taken at 9:30pm, when the last sunlight had long vanished, and only a slight glimmer of light was visible in the distance in the night sky. There was no illumination in this scene except for the lights coming from the buildings opposite, and in the distant background. Yet even with such little light capable of being captured by the sensor, it still managed to pick up more detail than I expected it would. 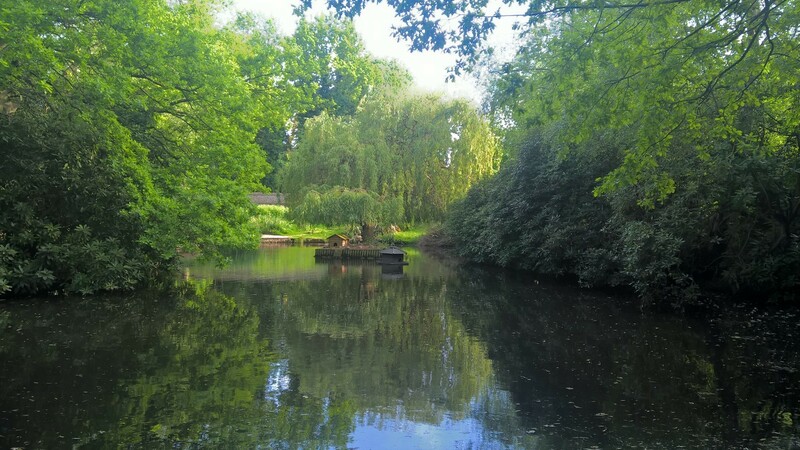 For comparison, here's that same image taken with Microsoft's flagship Lumia 930, which is packed full of PureView camera technology and witchcraft. 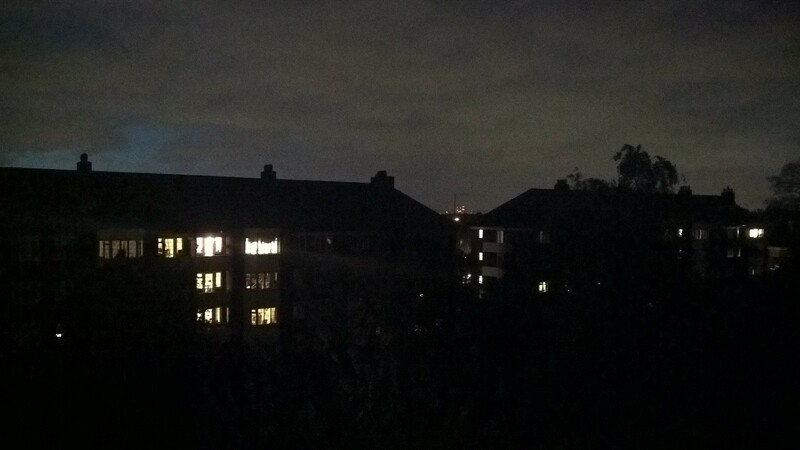 Clearly, there's more detail visible in this image, along with slightly more color variation, and the outline of the tree in the very near foreground, only barely illuminated by some of the lights in my building. 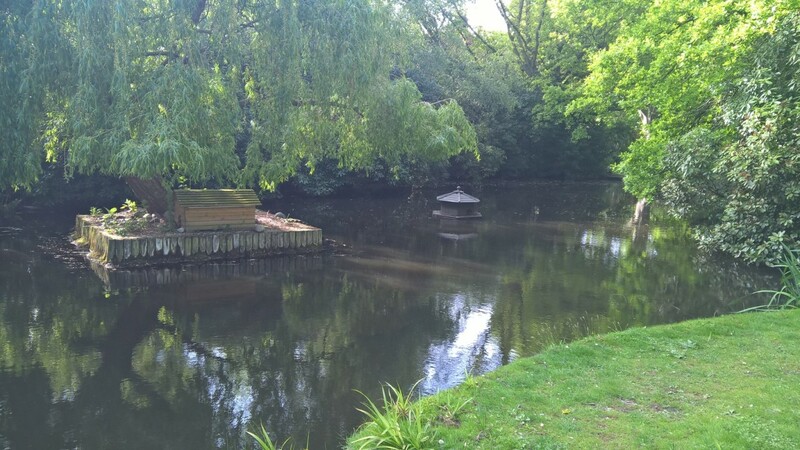 When you compare this with the photo captured with the Lumia 640 XL, the phablet's camera doesn't seem to have done all that bad. Yes, it's far from perfect - but then so is the 930's image, so you can't expect too much more of the much cheaper and less well-equipped XL. 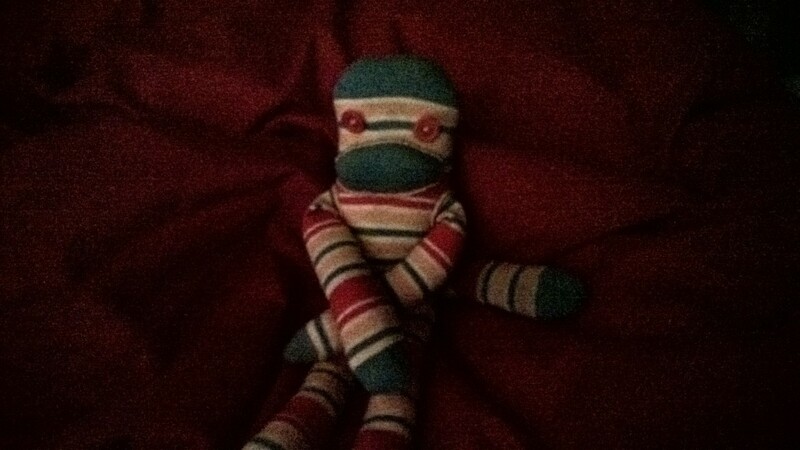 Meet my beloved Sock Monkey. This image was taken with the 640 XL, and the only illumination was coming from two of my desktop monitors on the other side of the room, and that light reflecting off the walls. 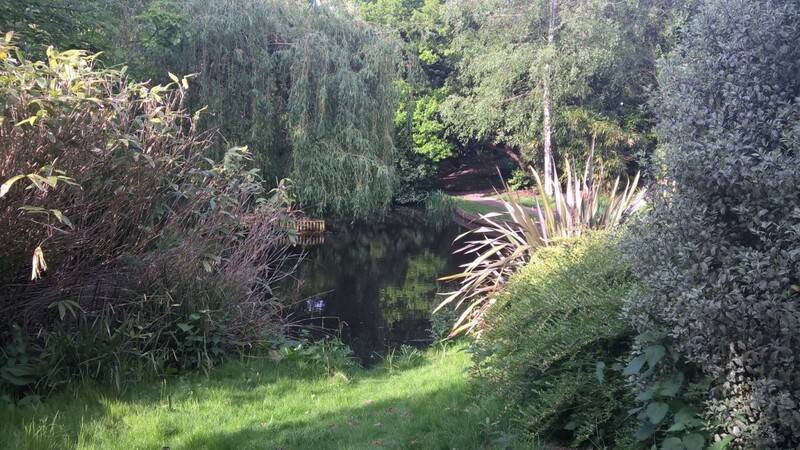 And again, to compare, here's that image captured with the Lumia 930. Here, the 930 does a better job of capturing the color in the scene, but at great expense to the overall quality of the image (and this image was in fact the best of five separate attempts at taking the photo with that device. The Lumia 640 XL didn't capture the richness of the colors quite as well, and it's a good deal darker, but it did much better in picking up the detail of the scene without the horrifying graininess of the 930 in the same ultra-low lighting conditions. Of course, the XL does have an LED flash (and the 930 has dual-LED flash), so if you find yourself with extremely limited light, that can be used to add some illumination to proceedings. This is one final example, showing how the camera can deal with 'concentrated' light - e.g. a bright light source in a dark room - such as when you want to quickly take a photo of something happening on the TV that you can't quite believe. 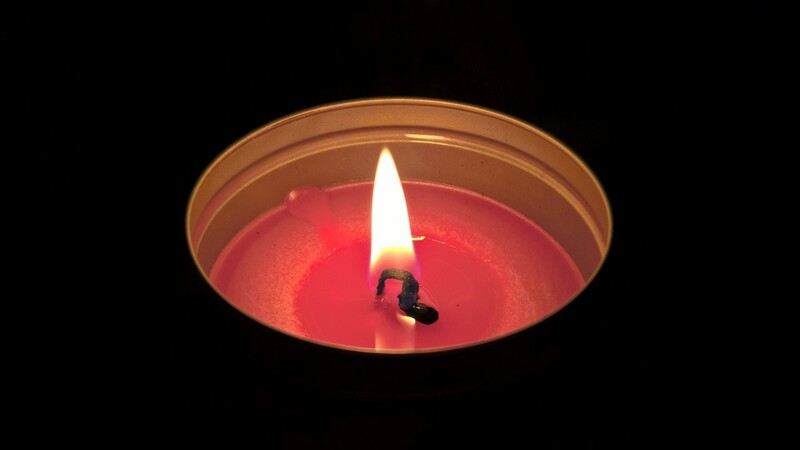 Here, I employed a more simple and basic test - taking a photo of a candle in a dark room. To take these photos, I reduced the amount of light allowed to enter the camera's sensor, to ensure that it didn't get overwhelmed by the bright light shooting out of the candle at close range. This might sound like a complicated operation, but it was no more hassle than sliding my thumb down a bit on the right-most slider, shown in the sample screenshot above. So it's clear that the Lumia 640 XL has a pretty decent camera, albeit one that doesn't capture the perfect shot every single time. If you leave all the settings on auto all of the time, you'll get some great images, but you're likely to find that some of your photos are a bit flat when it comes to color and contrast. 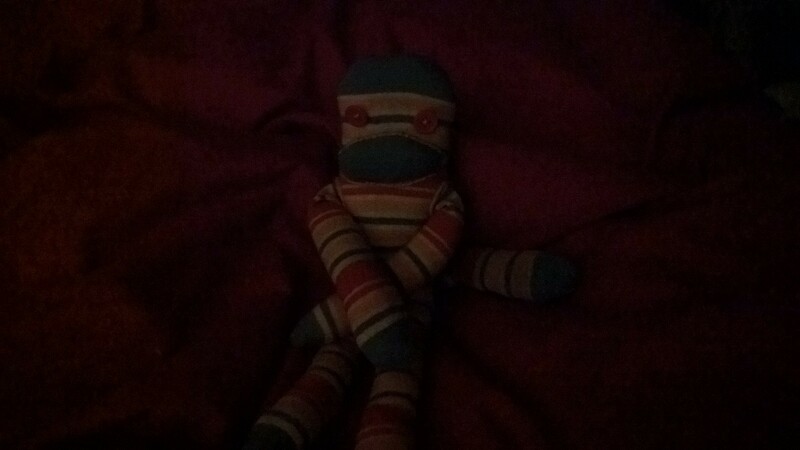 But it's worth playing around with the extensive range of settings and options that the Lumia Camera app offers - it might seem a bit intimidating at first, but the live viewfinder makes it easy to see how the changes you make will affect the quality of the shot, before you take it. With a pretty modest amount of effort, it can become second nature to tweak these settings whenever you take a photo, and to only rely on the default settings when absolutely necessary. And for those who don't want to make that effort, and prefer things to be a bit easier, the Rich Capture mode offers a simple solution to taking photos with much deeper and more vibrant color. One annoyance, though, was the absence of a dedicated hardware button for the camera. This has always been such a handy and genuinely delightful feature on Microsoft's higher-end Windows Phones, and I'm just not sure what the company gains by excluding it from its cheaper devices, aside from the infinitesimal savings on the cost of an extra button. That button is a small detail, but it adds so much to the experience of owning the device. 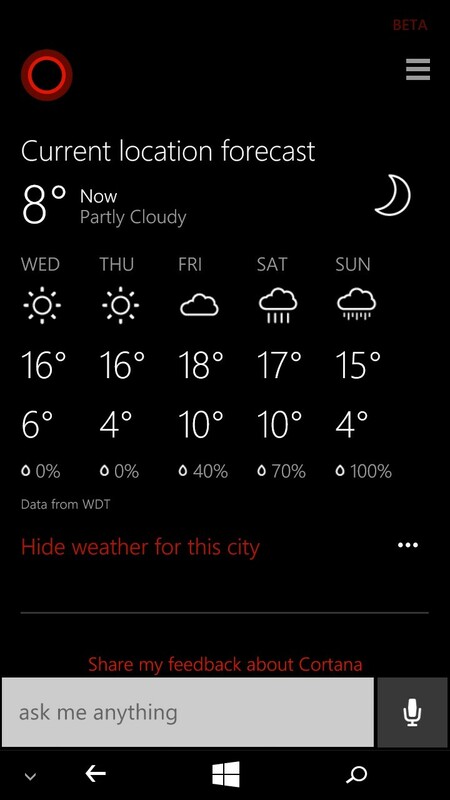 It's not the end of the world to have to turn on the Lumia 640 XL first, then swipe down the Action Center, and then tap the Camera button to launch the app, but it's just not as quick and easy as having the dedicated hardware button there, and the on-screen shutter button isn't quite as pleasant to use either. It's a minor detail, but personally, I found it frustrating, knowing that Microsoft could have eliminated that pain point very easily. 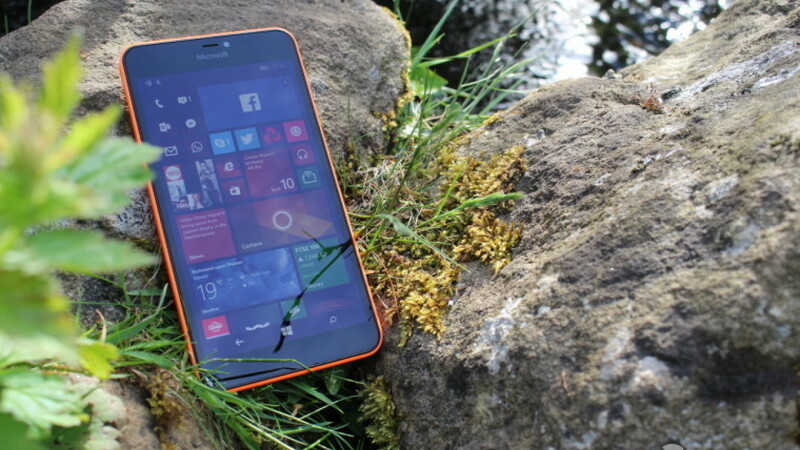 There's no other way to put this: the Lumia 640 XL is very, very good indeed. Its screen is big and beautiful - although some users will no doubt find it too large for their tastes, and I can certainly empathize with that. Using the device with one hand can be a struggle, but we'll be considering whether or not the slightly smaller Lumia 640 provides an equally attractive alternative to the gigantic XL in our upcoming review. But for those seeking a device with a (very) large screen without breaking the bank, the Lumia 640 XL is a hugely attractive package. Its performance is near-flawless, its battery life is outstanding, and it has a pretty good camera with impressive low-light capabilities. That said, the camera experience was, for me, undermined by the absence of a dedicated hardware camera button, as featured on other, more expensive Lumia handsets. As far as I'm concerned, there's no good reason for not including it on a device that - while still affordable - still costs a significant amount of money, and if Microsoft made that choice purely on cost grounds, as seems likely, that would be exceptionally tight-fisted of them. It's also worth repeating that the camera isn't always perfect in capturing the full range of color and contrast in a scene on auto settings, but there are alternatives to the defaults which work very effectively. 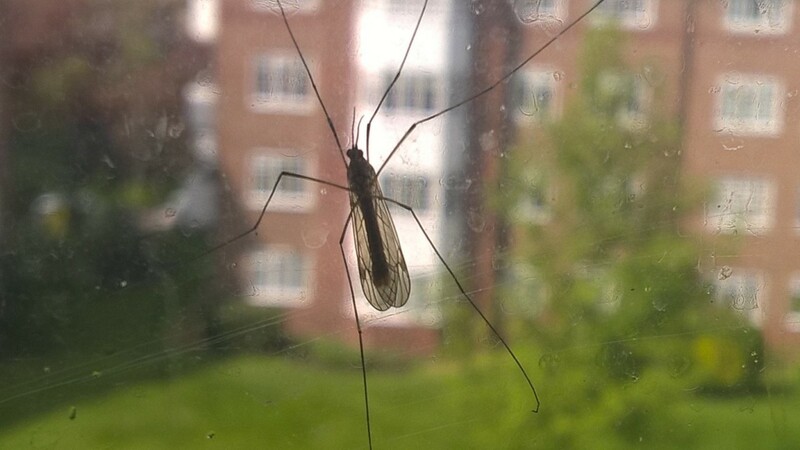 The real fly in the ointment, however, remains the same for the Lumia 640 XL as for any Windows Phone: the app problem. Microsoft is working hard to rectify that, and it may well make a difference with its new initiative to make it easier for developers to port their apps from rival platforms to its OS. 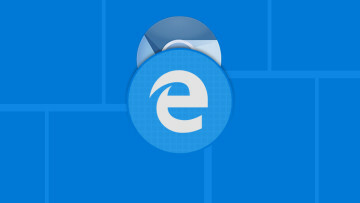 But it will take time for the effects of those efforts to materialize, and in the meantime, there remains a great many apps that still aren't available on Windows Phone, and plenty more apps that are available, but which are missing features that are available in the same apps on rival platforms. Sorry, Windows Phone fans, but the average user doesn't care about third-party app alternatives; they want official apps, and Microsoft knows this better than anyone - it's precisely why they're spending so much time and money to convince brands to bring their official apps to the platform, and to keep them there, and to keep them regularly updated with new features. Buyers have to be aware of the app situation before they throw down their cash to pick up a new handset - even one as good as the Lumia 640 XL - especially at the lower end of the market, where many folks are watching their pennies closely, and can't afford to regularly replace their smartphones. And considering how many pennies buyers are being asked to pony up, it's also a bit tight-fisted of Microsoft to only include 8GB of onboard storage, and not to include a headset in the box - although on that latter point, I certainly understand the argument that many buyers will already have a hands-free headset, or a preferred set of headphones, to use with the device, so I can't mark the company down too harshly for that. 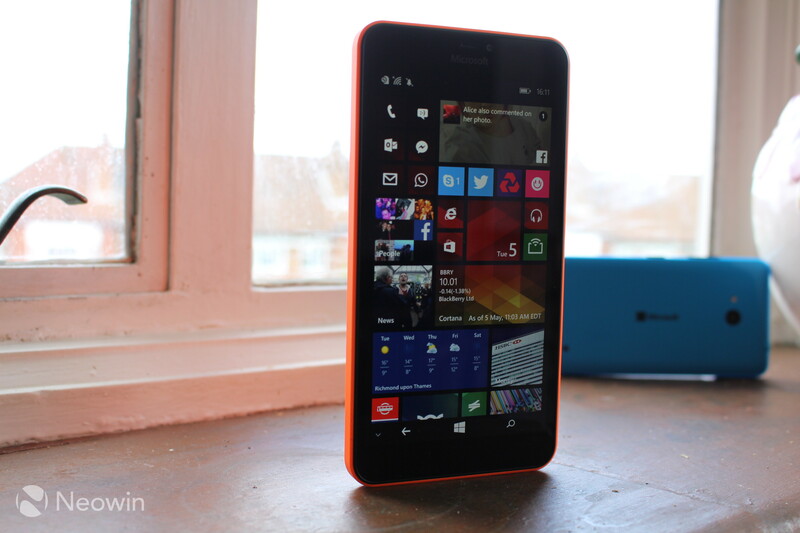 But really, the Lumia 640 XL satisfies in almost all areas, and excels in many others. At around €189 EUR off-contract for the 3G model tested here, and €219 EUR (£219 GBP in the UK) for the 4G LTE model, it's reasonably priced too, given how much it has to offer, and the devices it has to compete with in this price range. 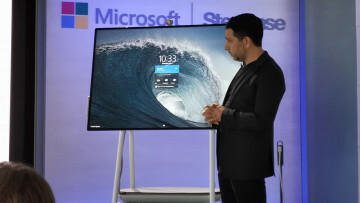 Microsoft has built a huge handset that offers great features and superb value - especially with that Office 365 subscription thrown in - a massive device upon which it has proudly placed its logo. And rightly so - there's still some room for improvement, but the Lumia 640 XL is a device that Microsoft should be proud of. Even a review as extensive as this one hasn't covered every single aspect of the device. 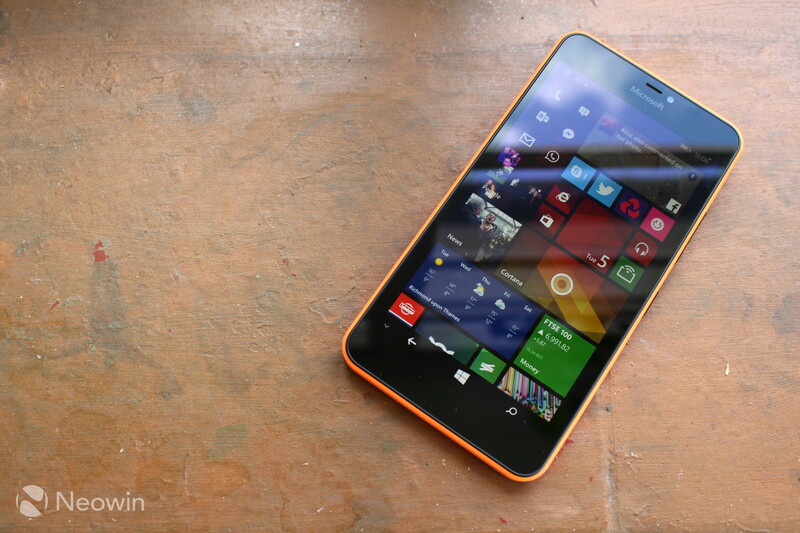 Do you have any questions about Microsoft's Lumia 640 XL? Ask them in the comments below or hit me up on Twitter @gcaweir, and I'll do my best to answer them!